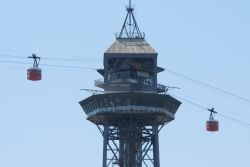 The cable car in the port of Barcelona, known as the Aeri del Port, has been bringing passengers back and forth from the beaches in Barcelona over the port to the Montjuïc Mountain since 1931. 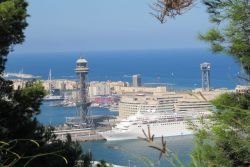 The breathtaking and dramatic views over the city of Barcelona from the totally renovated cable cars are truly awesome. It’s really difficult to recommend what time of day or in what season you should take a ride, as perfectly illuminated views of the city can be seen whenever you choose to go. January 1 to February 28: 11:00 h. to 17:30 h.
March 1 to June 2: 11:00 h. to 19:00 h.
June 3 to September 8: 11:00 h. to 20:00 h.
September 9 to October 27: 11:00 h. to 19:00 h.
October 28 to December 31: 11:00 h. to 17:30 h.
During the amazing cable car trip you’ll be sure to recognise Barcelona Airport to the south of the city and the small towns of the Maresme region towards the north. On the opposite side of the city you can also see the silhouette of the Tibidabo Mountain crowned by its majestic church. Three metallic towers support the Aeri del port cable car, the Sant Sebastià in the Barceloneta, the Jaume I in the middle and next to the World Trade Centre building and the Miramar at Montjuïc. 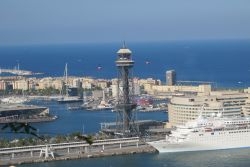 You can start your trip from both sides, either from the Montjuïc Mountain at the Miramar Avenue and travel towards the port and the Barceloneta district with direct access to the beaches of Barcelona or the other way round.